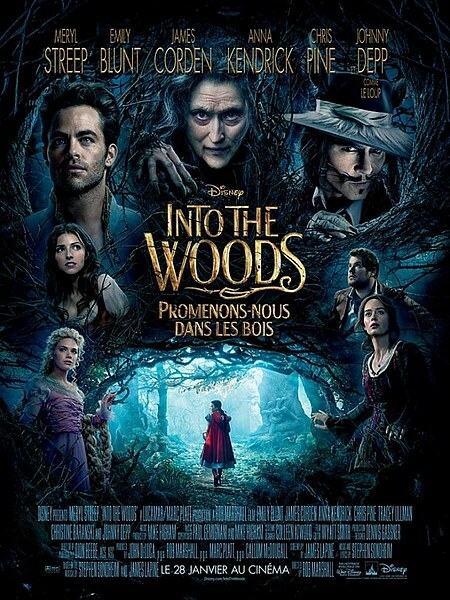 Rob Marshall’s Into the Woods adapts the famous stage musical of the same name and throws it onto the big screen for all to see. The basic story is that a Witch (Meryl Streep) enlists a Baker (James Corden) and his wife (Emily Blunt) to bring her magical items from various fairy tales in order to reverse the curse on the Baker’s family and allow the couple to have a much desired child. It’s a simple quest that allows the different fairy tales to come together and interact in whimsical ways. There is some really good comedy in how these fairy tales interact. Seeing Jack (Daniel Huttlestone) climbing the beanstalk to steal something because Little Red Riding Hood (Lilla Crawford) dared him to is really funny. The representations of these familiar characters are really entertaining with impressive turns from a generally stellar collection of actors. Anna Kendrick’s Cinderella is sort of lovably vacant with a very narrow view of the world she lives in. She seems to be a great match for Chris Pine’s Prince character who is equally as vacant and even more charming. Pine’s performance is really entertaining as he hams it up to a degree that would make former Captain Kirk William Shatner proud. James Corden and Emily Blunt have really great chemistry as a humble husband and wife duo. It’s not every day I can say that I saw a film with James Corden playing one of the leads and enjoyed him in it. These two characters are very much the heart of the film as the story happens around them. This works very well for the most part with some amusing situations featuring these two characters. There are too many characters to mention every one of them but I’ll give honourable mentions to Meryl Streep’s Witch, Lilla Crawford’s Little Red Riding Hood and Daniel Huttlestone’s Jack who all do a great job with the characters they are given. Meryl Streep manages to make every scene she appears in more over the top and entertaining and Lilla Crawford is hilarious as a scene stealing snarky Little Red Riding Hood. Mercifully there isn’t much of Johnny Depp playing The Big Bad Wolf in the style of The Mad Hatter or Jack Sparrow or pretty much most of his recent cinematic appearances. If there had been more of this character featured then I would have been far more irritated. With this being a musical some mention must be made of the songs. Obviously this will entirely be a matter of taste but I found them catchy enough. Much of the soundtrack sounded like the next verse in the same song but there was a strong motif throughout. The cast all did a great job as singers with some surprises in there in terms of singing ability for me. I had no idea Chris Pine or Emily Blunt could sing so well. The film suffers from a narrative that is entirely too busy. I can see how this would have worked on stage but as a film it feels like characters and story threads come and go with little to no development. Aside from that the film sometimes feels like a stage show with some visual choices that don’t quite work for a film but look like they were designed for stage. Structurally the film is very problematic. Beyond the plot threads coming and going there are significant pacing problems. Certain parts of the film feel like they go on forever with others feeling like they last no time at all. I did feel that the film continued for about 20 minutes after what feels like a logical end point. A special mention should be made to a handling of the concept of infidelity so clumsily that it really defies belief. It honestly has to be seen to be believed. An ambitious project to convert from stage to screen given the sheer volume of characters involved. This adaptation is partially successful at bringing the stage musical to the big screen. A talented cast with capable singing voices help to carry this film that is not without entertaining parts. Some of the story is told very well with some clever interactions between the various fairy tale characters. James Corden and Emily Blunt to a great job playing the characters of the Baker and his wife forming the heart of the story. Lots of humour comes from the interactions between the different fairy tales. In some cases a character from fairy tale inspires something famous from another to amusing results. I liked how these blended together. The highlights of the cast were unquestionably Chris Pine, Meryl Streep and Lilla Crawford who inhabit their characters so completely that they can’t help but be a joy to watch. In terms of soundtrack I found the songs to be very catchy and the film had a great sense of aural identity. Most of the music sounded like different verses of the same song and blends into the story really well. At times the narrative feels very busy with plot threads coming and going quickly with no real resolution. What works on stage doesn’t necessarily work on screen and this film is living proof of that. I also felt that the film continued for about 20 minutes after the point where it should have ended.